Canvas Corp Brands had a new challenge for the Crew : use fabric ! Ok. I have a sewing machine. But I barely used it for fabric (except on my daughter's request for her project...maybe I should ask HER to create something...). Let's not talk about sewing. So I choose to use fabric as paper, and I came up with upgrading a photo book ! 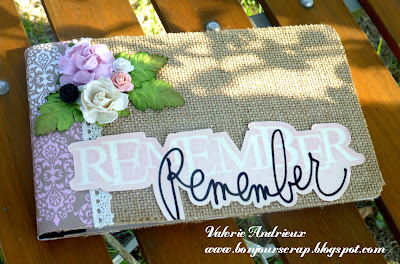 I used a burlap sheet (Canvas Corp Brands) to cover the book, with some damask paper, white lace and flowers to add some shabby touch. The title is a mistable flocked and resist title by Tattered Angels, mist with Wedding Pink (Tattered angels) and cut out.